So where do we find ourselves now? The worry by many of a bubble in stock and real estate prices is rooted in the rapid rise in prices dating back to the 2009 lows. Their error lies in the fact that the rise occurred, not from an already rising market, but to the contrary, generational lows. Just as bubbles reach emotional extremes the ensuing crashes mirror this in the opposite direction. When the Dow hit sub 7000 in 2009, many, including myself felt that the financial system was literally imploding to a point of no return. Since that year, the market has risen roughly 150%. Land value has risen anywhere between 30% and 100% depending on the area. OMG! BUBBLE!!!! Actually no. Had these gains occurred from high starting points, I would be crying bubble along with those who are. However, they occurred from massively depressed, emotional lows. I would suggest that half of the gains of the last 6 years, were merely unwinding the anti-bubble, or to put another way, the artificially low prices brought on by fear and forced selling. What’s more, this run has been characterized by well qualified borrowers and cash buyers. Far from over-leveraged. To further this point, let's look at the 15 year return of both stocks and real estate. Rather than cherry picking small time frames to make a case, it helps to look at longer, more normalized periods. On Jan 1, 2000, the Dow Jones Average stood at 11,473. With today's level of roughly 17,000, this represents a 15 year increase of roughly 50%. Not taking into account dividends, this equates to roughly 3% annualized gains. If you include dividends, you could argue the number is more like 6%. With the long-term norm of something closer to 10%, this is far from bubble behavior. Without getting too deep in the weeds, real estate gains have similar metrics nationally, albeit coastal land numbers fair better for obvious reasons. The reality of the situation is that despite unprecedented volatility, the last decade and a half have actually seen sub-par returns. We are actually now in a place that has normalized some of the extremes seen in the 21st century. Could we see a correction in these markets? Of course! Can you time these by trying to sell high and buy low? Very unlikely. Wealth is created by investing in quality and avoiding the wrath of the tax man by holding for the long run. Ask Warren Buffet. If we are lucky enough to see a meaningful correction, and you are fortunate enough to have some dry powder (not the kind we are seeing in the Sierra's), take that cash and shop while things are on sale. There is no bubble. The world is not ending. America is still the best place on the planet in which to put your hopes and dreams, despite questionable leadership. Prosperity awaits anyone with patience, vision, and discipline. So forget the bubble scenario. Keep your eye on the ball. Live life without fear and trepidation and have an AMAZING 2016! 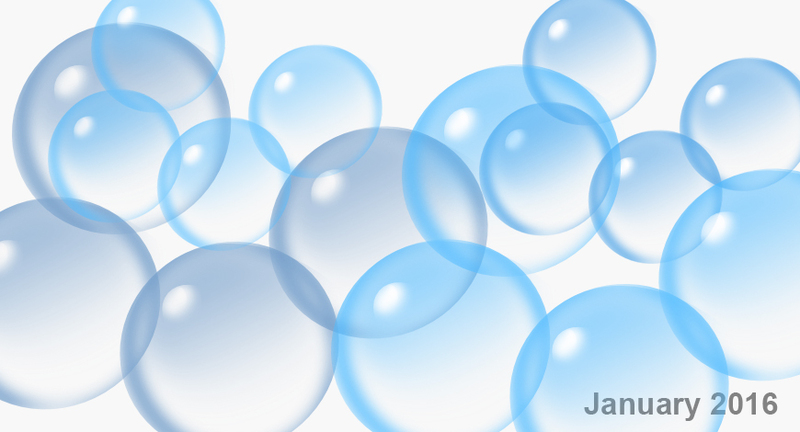 A central feature of bubbles, always overlooked by investors until the collapse, is that an extended period of speculation dramatically changes the return/risk characteristics of whatever market is involved.